sera provides a broad range of products for freshwater aquariums. Here you will find healthy and particularly easily digestible fish food for your freshwater fish. The new aquarium care system by sera solves all problems in freshwater aquariums with just one product per step. sera provides numerous technical products for freshwater aquariums. sera provides a broad range of products for marine aquariums. Here you will find food for the inhabitants of marine aquariums that match the various feeding habits particularly well. Good water quality is particularly important in marine aquariums. Here you will find the suitable products for creating optimal water parameters. sera provides numerous technical products for marine aquariums. sera provides a broad range of products for ponds. Systemic pond care. sera systematizes pond care according to frequently occurring problem situations. Here you will find the right products for systematically ensuring optimal water quality in your pond. sera provides numerous technical products for ponds. sera provides a broad range of terrarium products. Here you will find appropriate staple and additional food for terrarium inhabitants that match the various feeding habits optimally. In this area you will find care products for reptiles and small animals. sera provides numerous technical products for terrariums and aqua-terrariums. 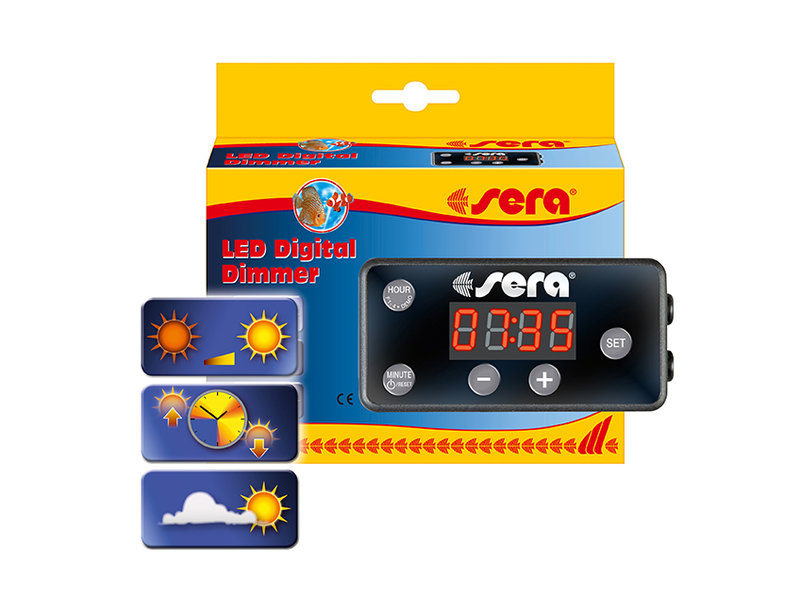 The sera LED Digital Dimmer allows controlling all sera LED products. Furthermore, the dimmer allows simulating sunrise and sunset as well as two different cloud scenarios. Now the dimmer has been reworked, and from now on provides an additional simulation: midday dimming, during which lighting is dimmed down to 30% of the maximum brightness. Midday dimming (from 1 p.m. – 3:15 p.m.) is firmly programmed into the additional programs F5 – F7 and thus simulates dense clouds at noon, which is frequent in the tropics, and which leads to natural reduction of light intensity. Since it is not entirely dark in nature during this time, midday dimming is also not set as an entirely lightless phase. Due to midday dimming, the photosynthetic systems of the plants are not overburdened in spite of long lighting times (from morning until evening). Whether there are problematic water values, ornamental fish disease or questions about our products – we will be happy to provide personal support!